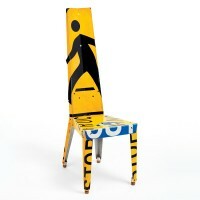 Surprisingly comfortable design for everyday use. 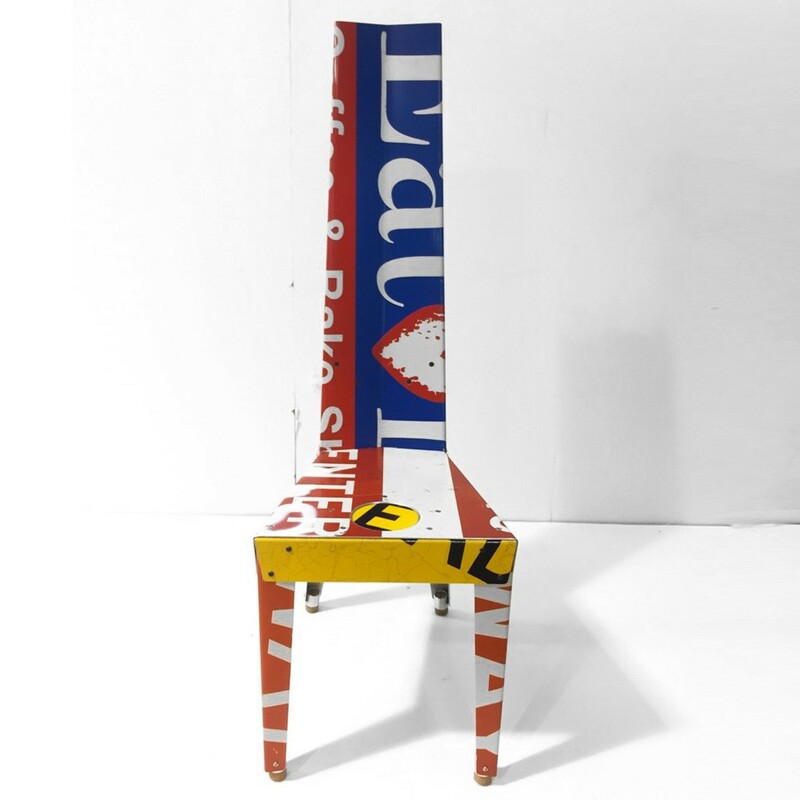 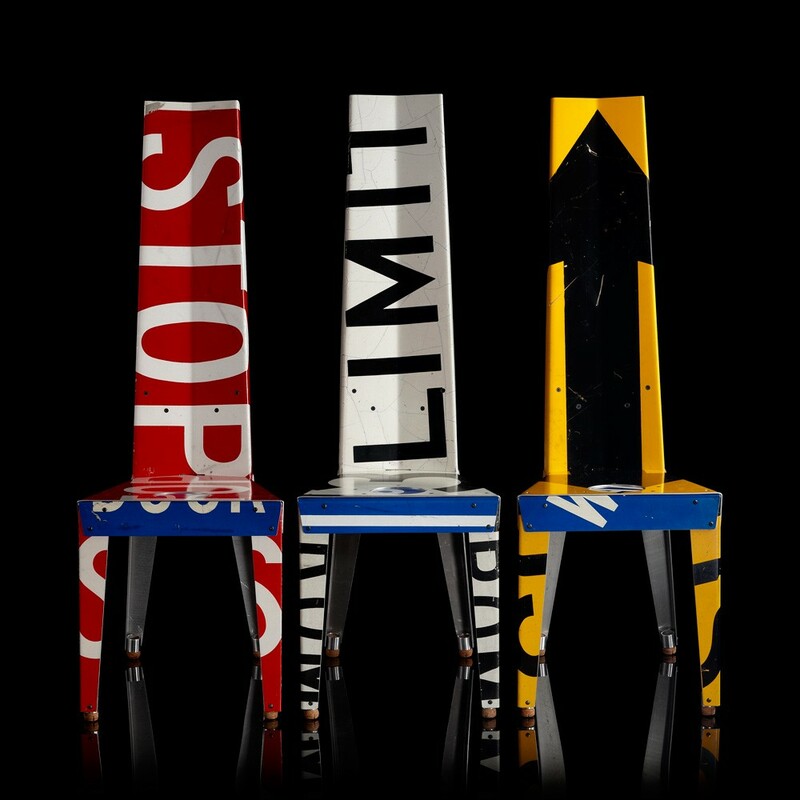 HUMANUFACTURED® (hand-fabricated, hand-pierced and brake formed in Bally’s Providence studio) furniture made from upcycled aluminum traffic signs, champagne corks, steel hardware. 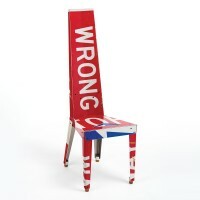 Shipped KD, globally, for customer assembly. 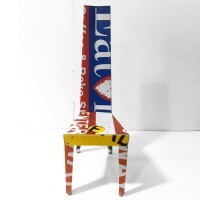 Upon purchase buyer and seller can correspond regarding specific chair selection. 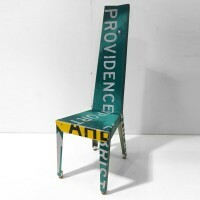 The ‘transit chair’ is hand formed and fabricated in Bally’s providence studio. 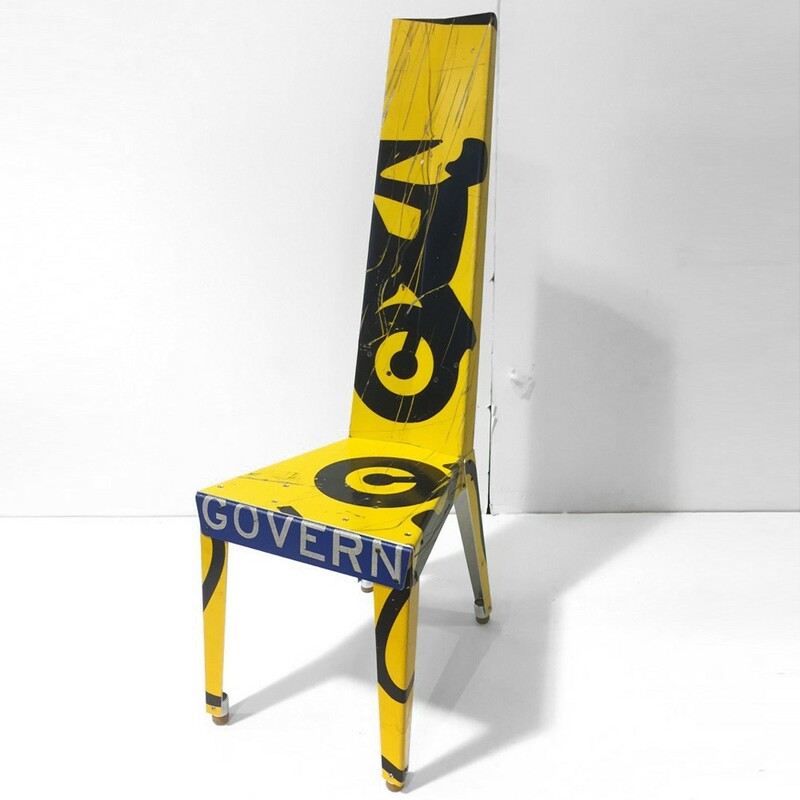 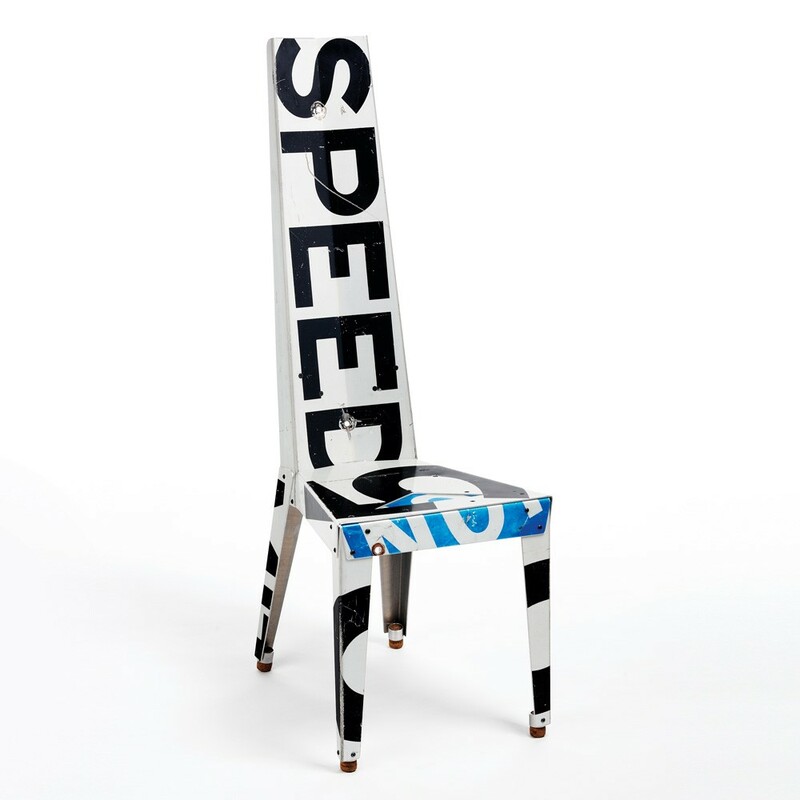 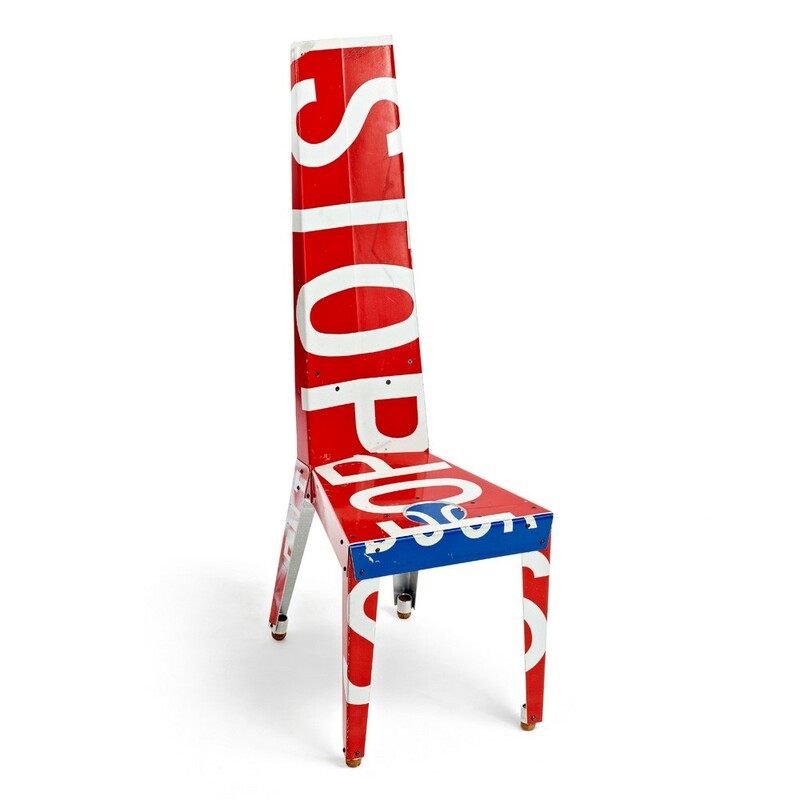 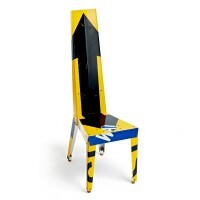 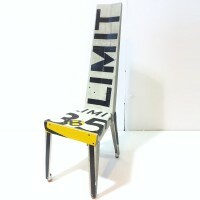 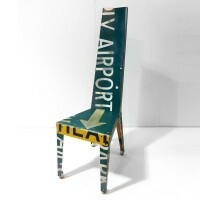 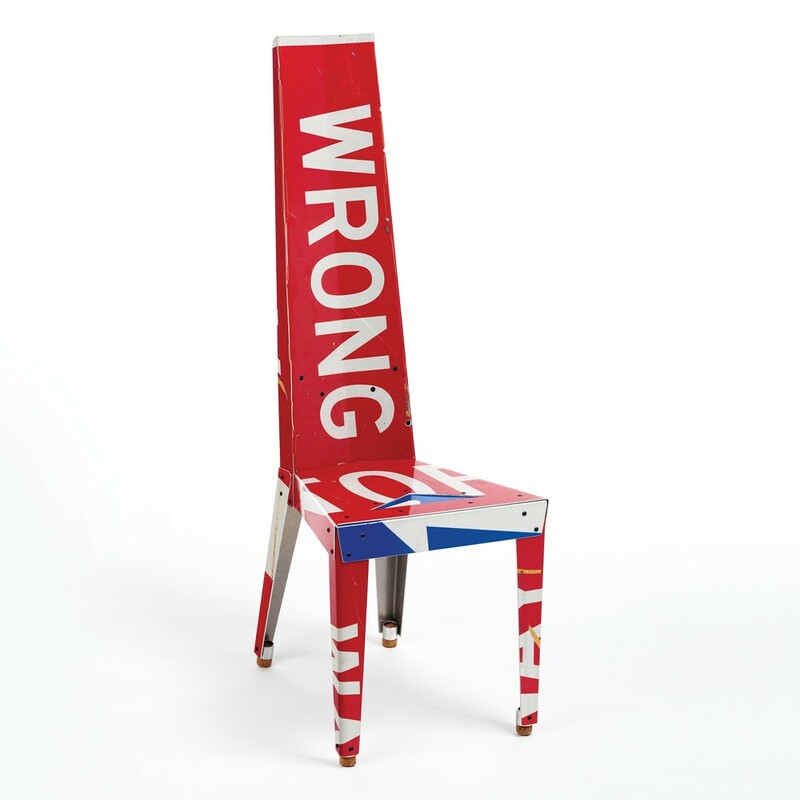 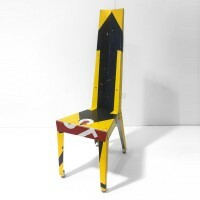 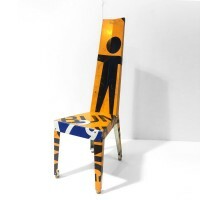 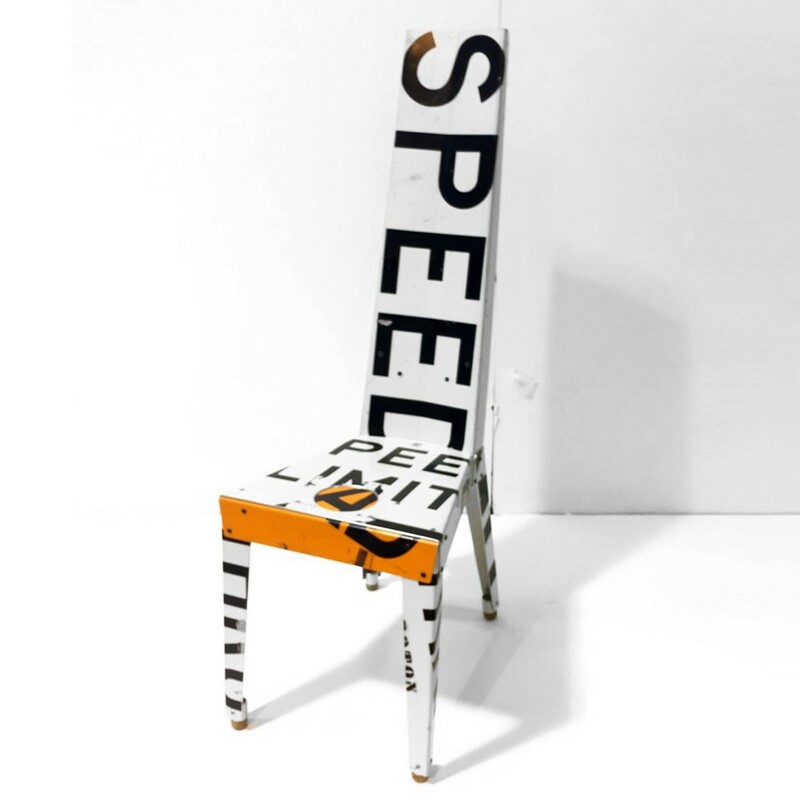 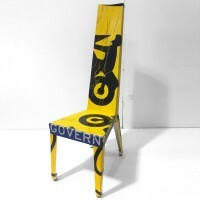 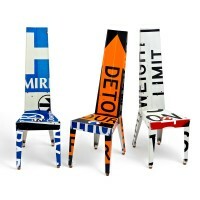 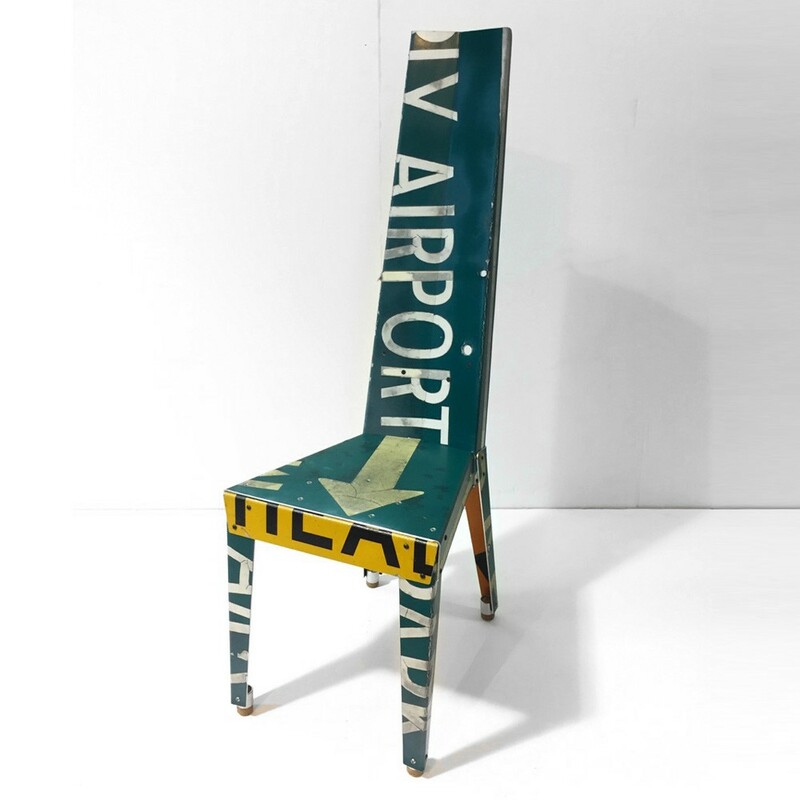 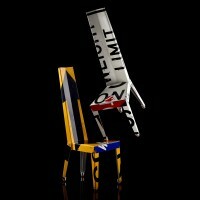 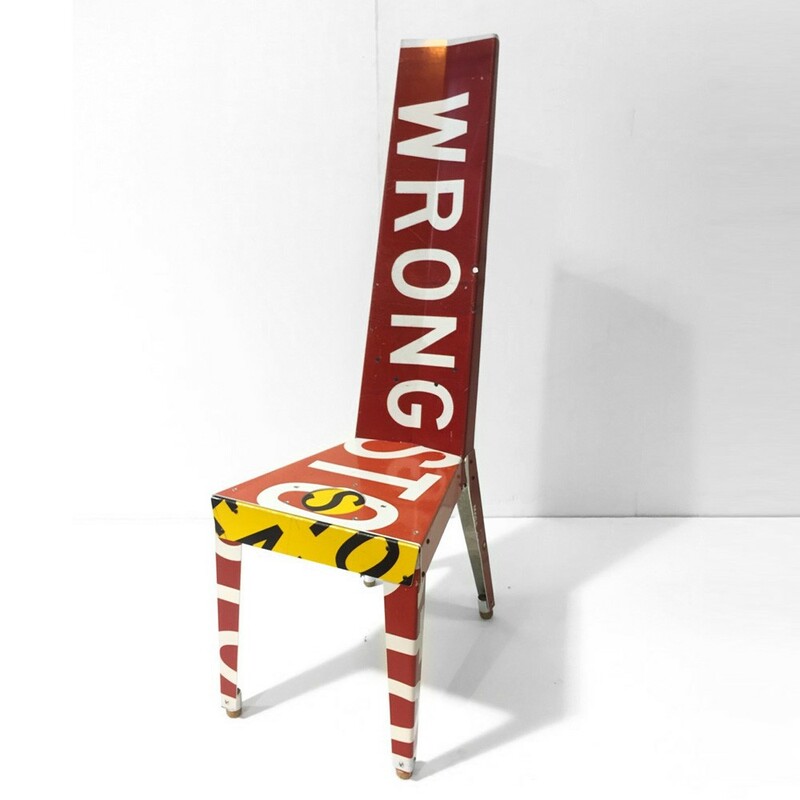 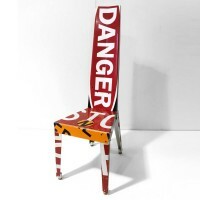 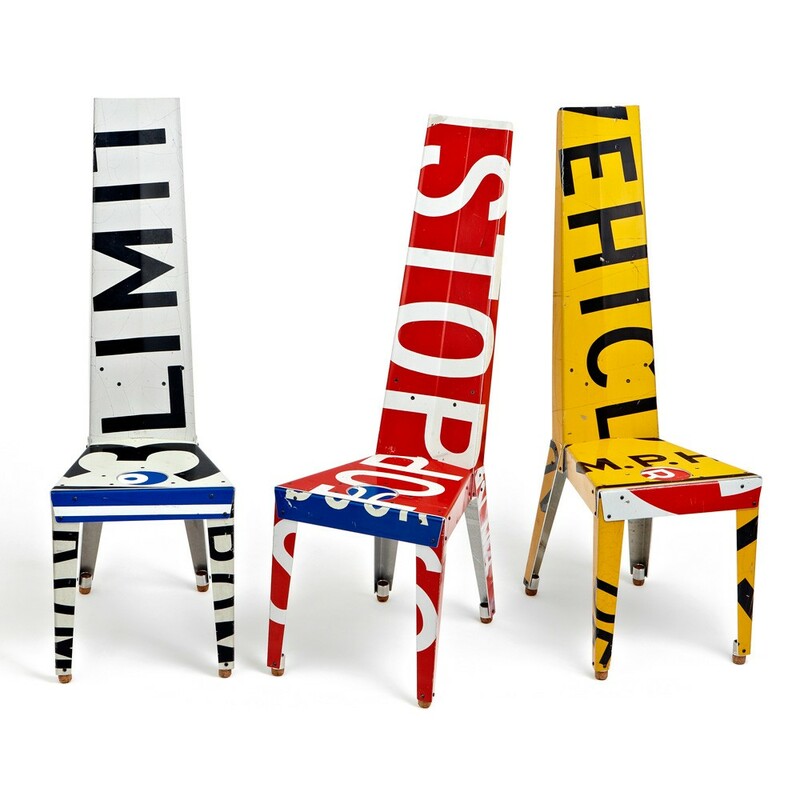 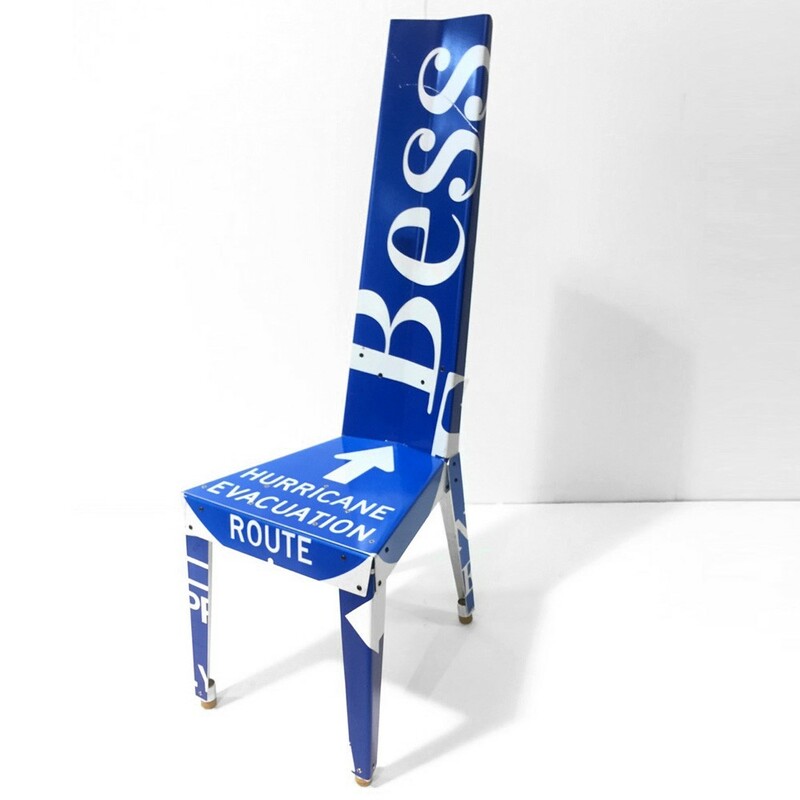 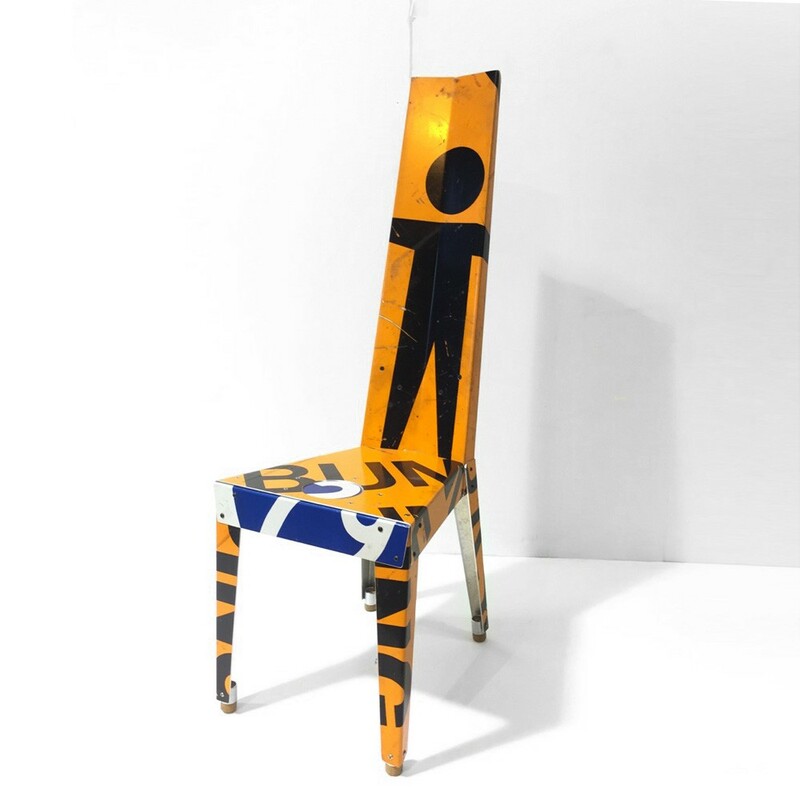 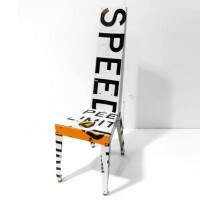 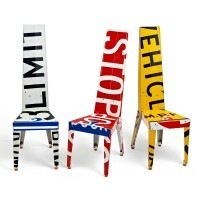 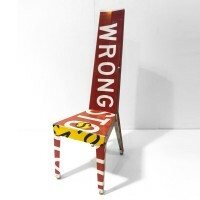 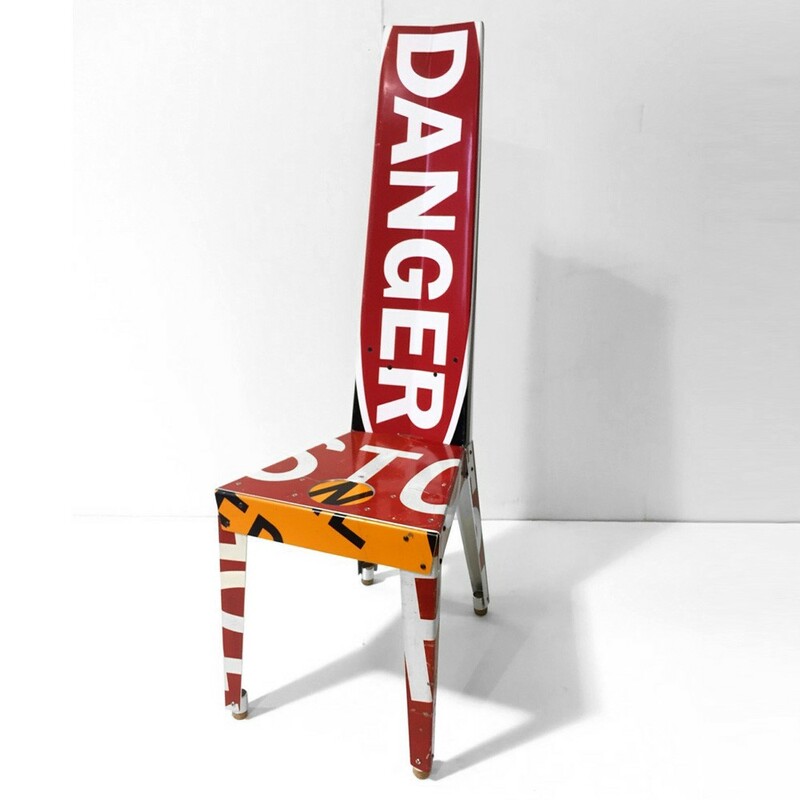 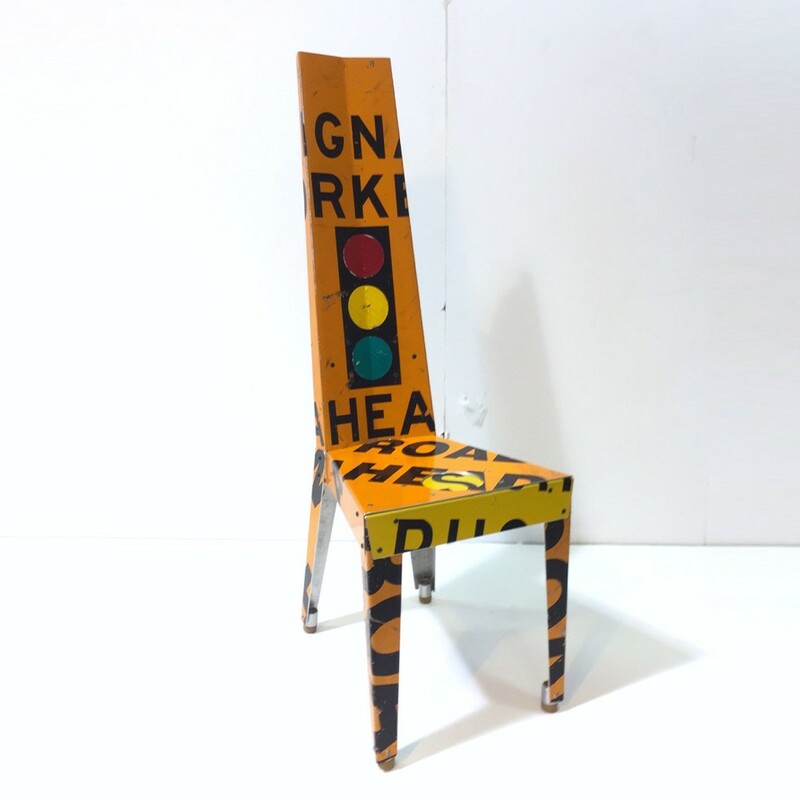 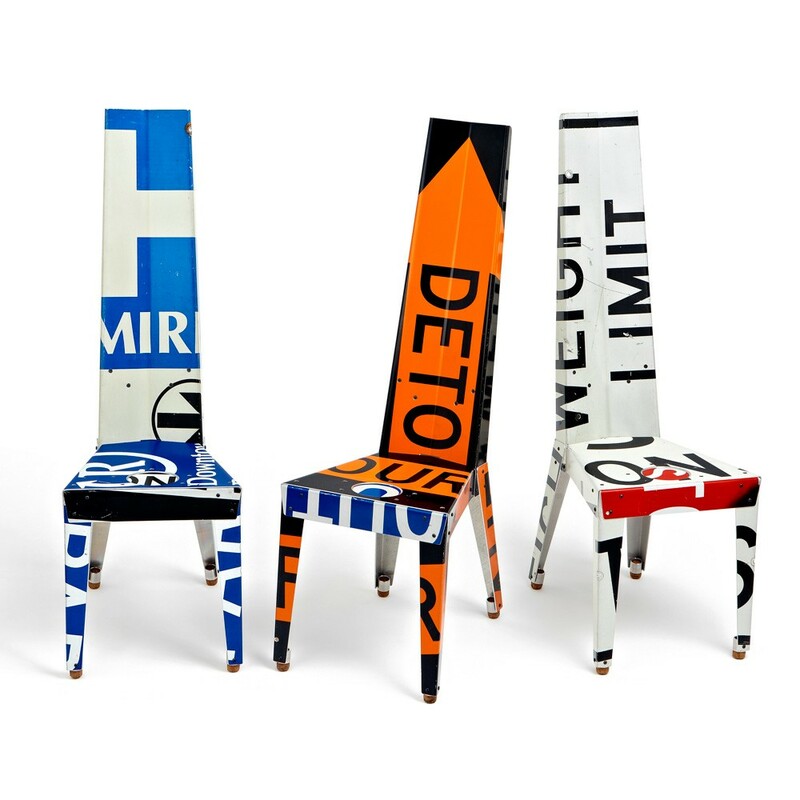 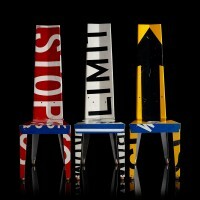 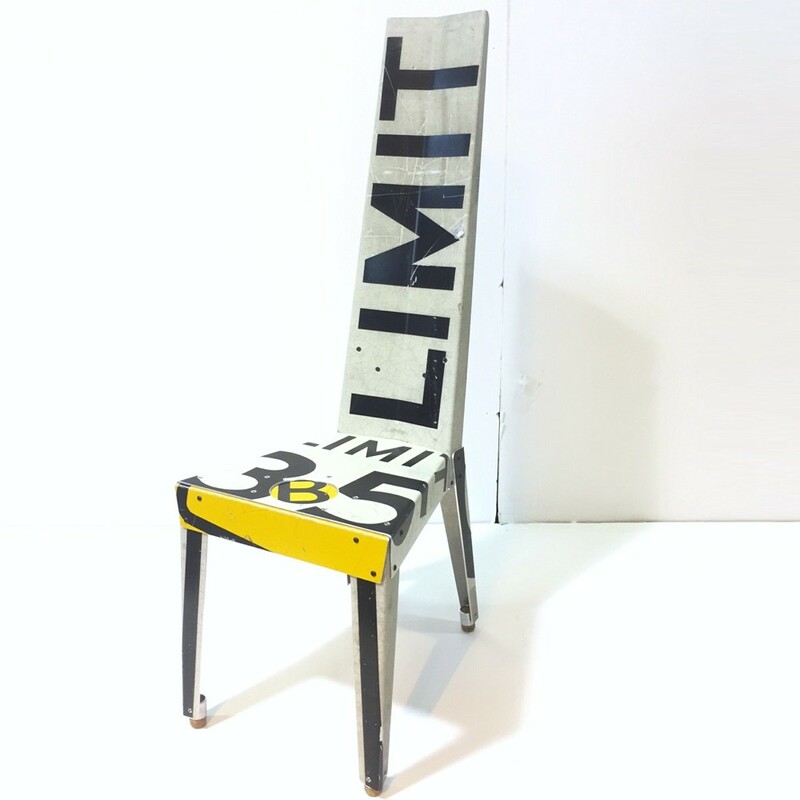 Each chair is constructed from upcycled aluminum traffic signs, champagne corks, and steel hardware. 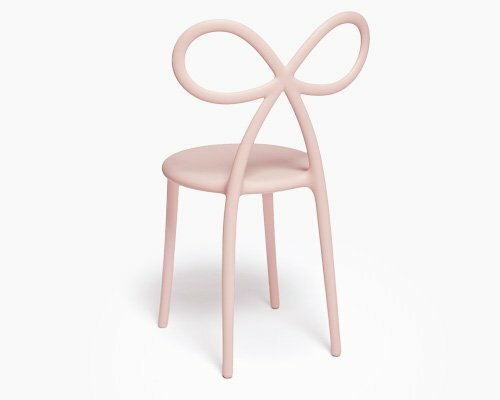 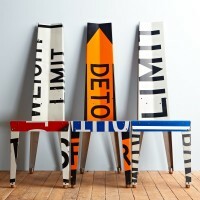 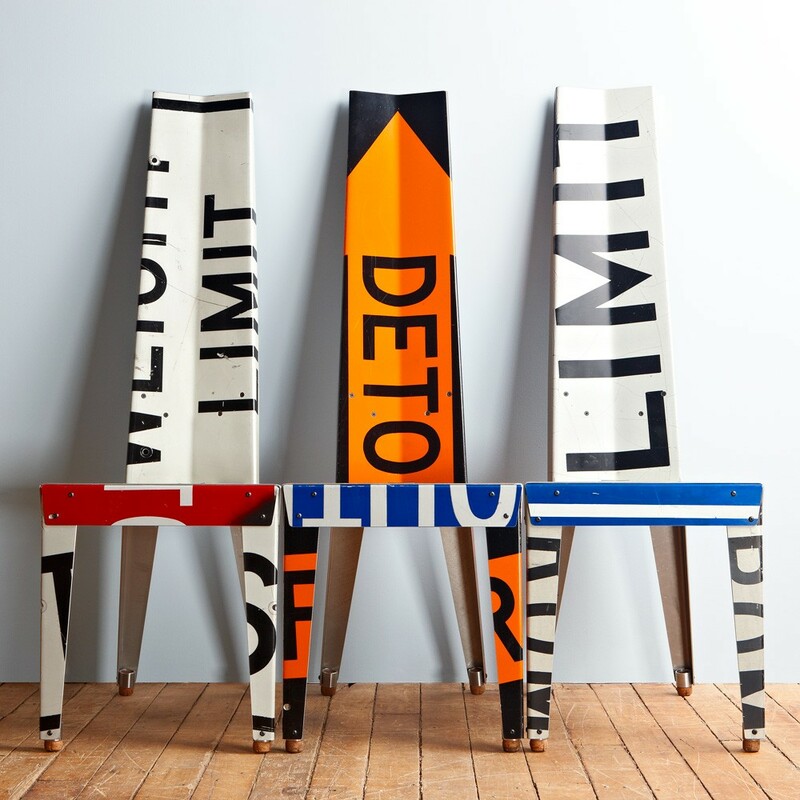 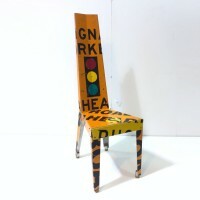 The piece creates a surprisingly comfortable seat while maintaing the coarse urbanism of the street signs. 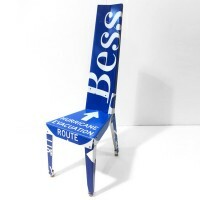 The chairs are shipped globally and require some assembly. 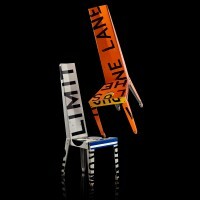 Due to their one of a kind nature there is only one copy of of each chair. 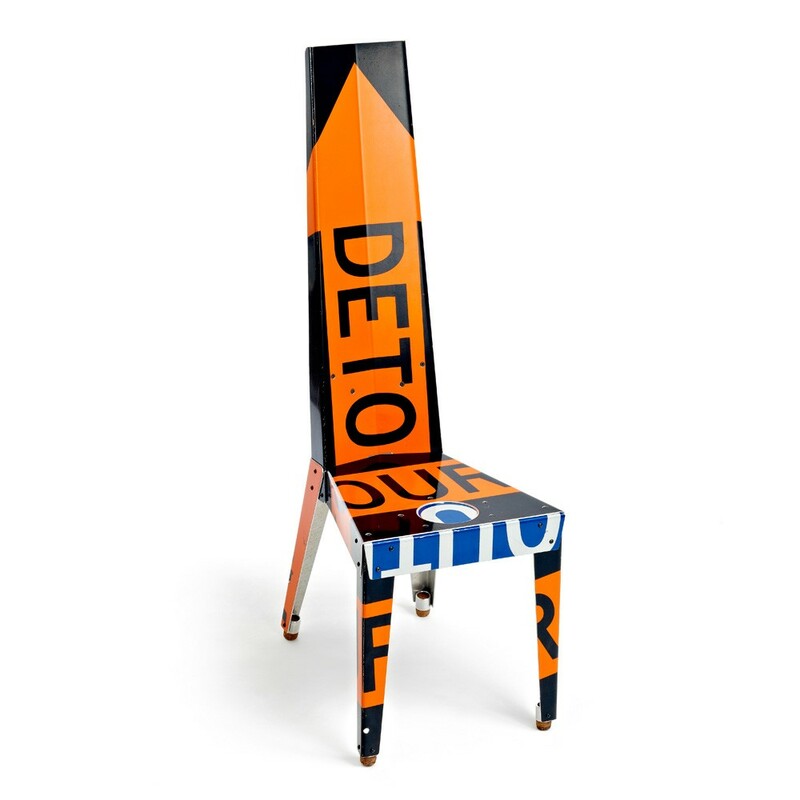 Boris Bally was a finalist in the 2013 Eco Arts Awards and the recipient of a 2012 Eco Arts Awards Honorable Mention for Repurposed Materials in Art &amp;amp;amp;amp; Design. 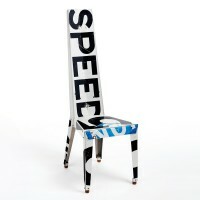 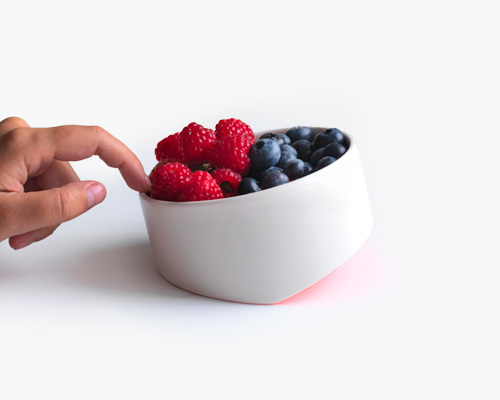 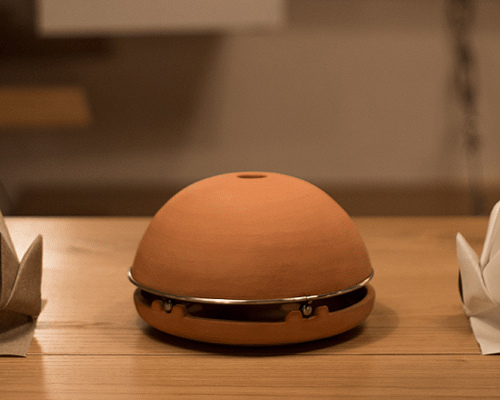 He was a finalist in the 2009 International Spark Design Awards. 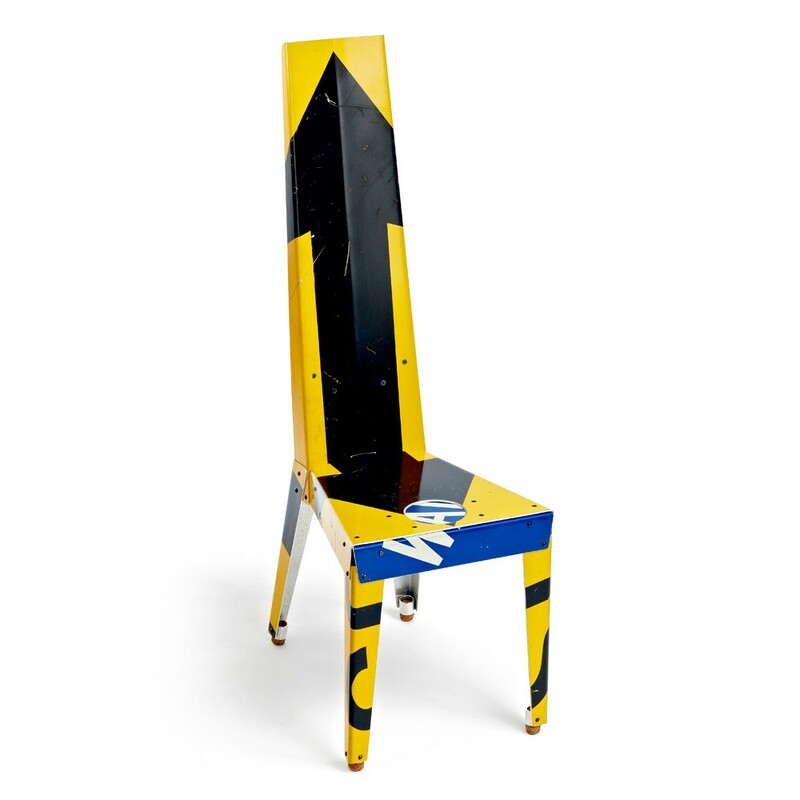 Bally received the 2006 Individual Achievement Award for Visual Arts presented by the Arts &amp;amp;amp;amp; Business Council of Rhode Island. 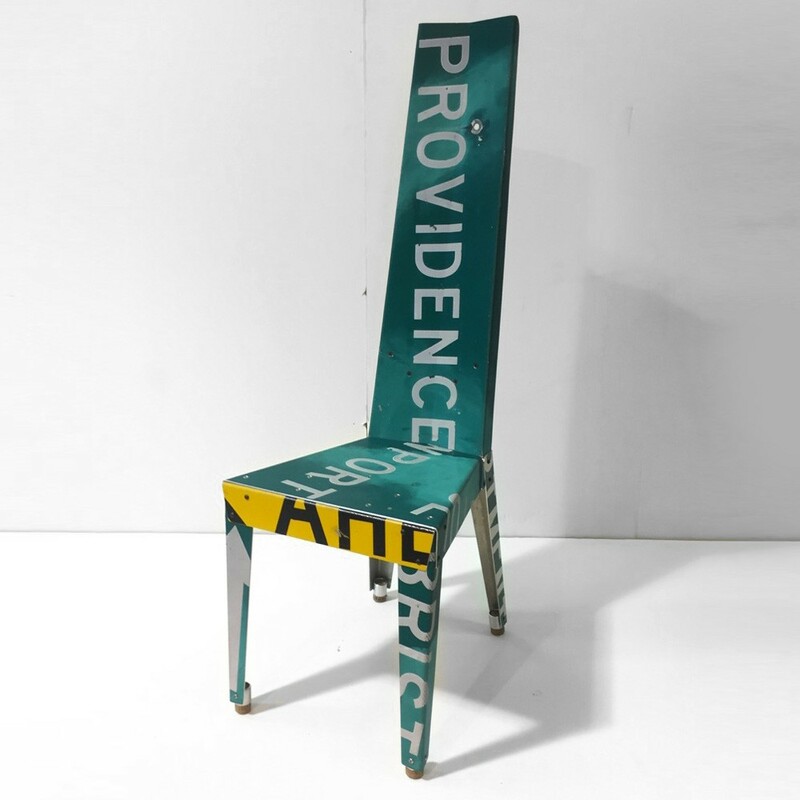 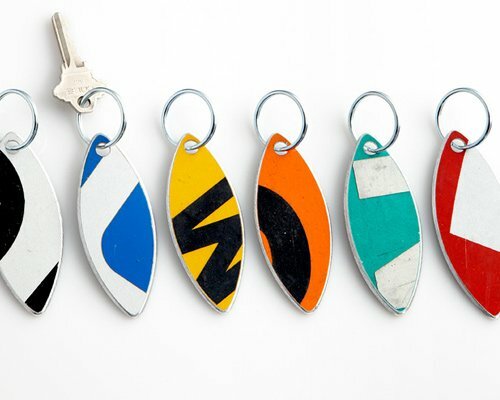 Bally’s work has received two Rhode Island Council on the Arts Fellowships in Design and a Pennsylvania Council on the Arts Crafts Fellowship. 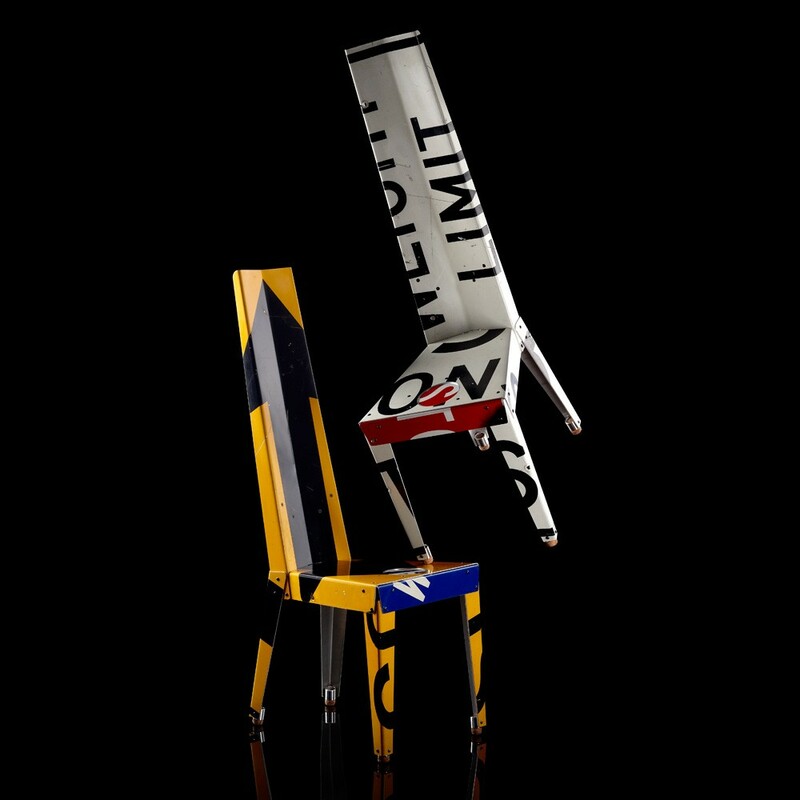 His work has been featured in numerous international exhibitions and publications. 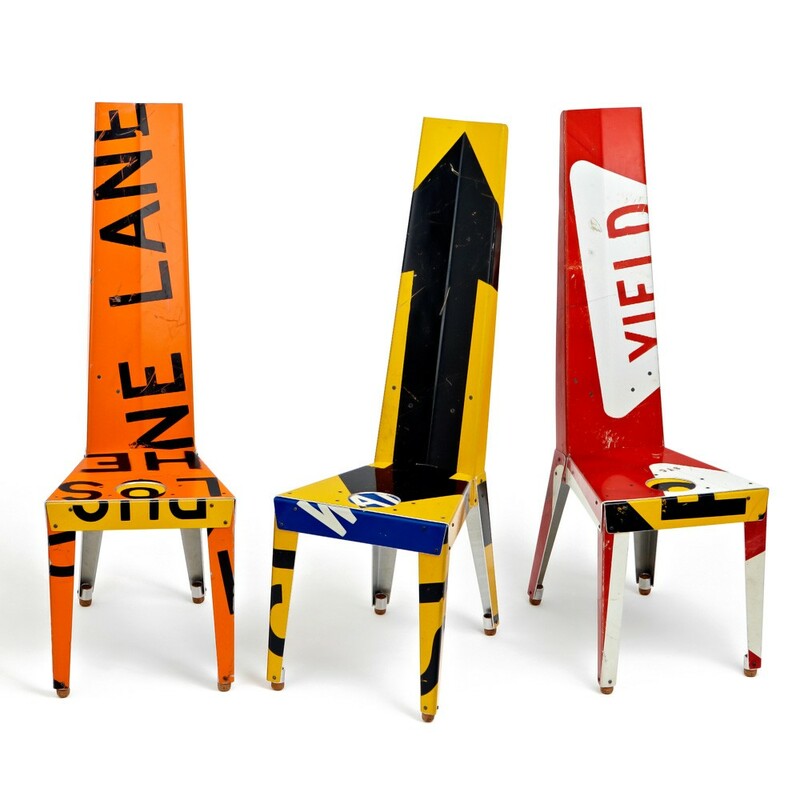 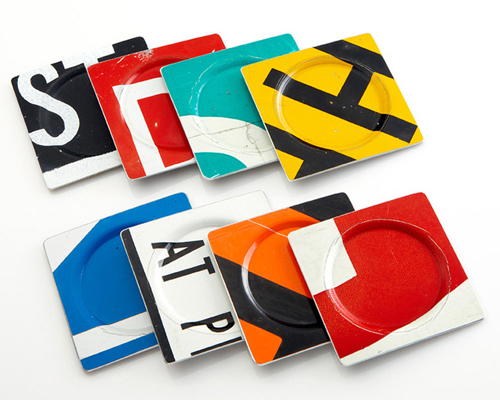 Public collections include London’s V&A Museum, Museum of Fine Arts Boston, Museum of Art & Design New York, Carnegie Museum of Art Pittsburgh, Brooklyn Museum, Luce Foundation Center, Renwick Gallery and Cooper Hewitt National Design Museum. 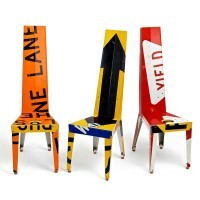 Ships KD for customer assembly. 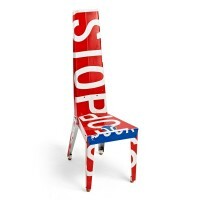 Easy to follow instructions, stainless screws and tool included. 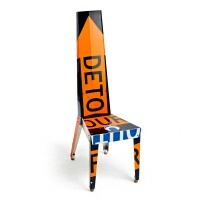 Full product refund, without shipping costs, upon receipt of returned item if not completely satisfied.